Use /dgks to quickly open to GUI. Or navigate to it through the built-in Blizzard game menu. Sound Notifications: Plays Unreal Tournament, DoTA, Mortal Kombat, or custom sounds when you get a kill-shot. Statistics: Records who you have killed and who has killed you. Execute: Plays sound when target hits a configurable life threshold. Screenshots: Takes a screenshot on kills, multi-kills, streaks, or deaths. Emotes: Does a built-in and/or custom emote on killshots. Text Notifications: Many output options including scrolling text mods, chat windows, emotes, etc. 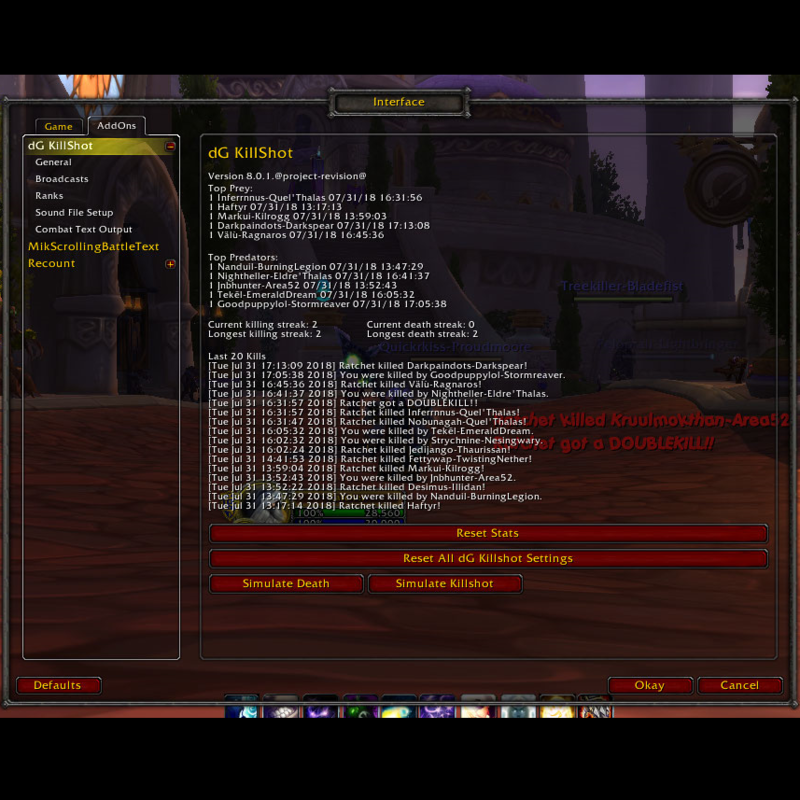 Synchronized Communication: With all other mod users in your group, raid, guild or BG. Streaks: Plays different sounds depending on the length of your killing streak. Multi-kills: Different notifications for streaks of kills in a short period of time. Easy Configuration: GUI integrated into the Blizzard add-on interface. Logging: Kills and deaths are logged and displayed in the GUI. Very Customizable: Add custom .mp3 or .ogg files. The Interface setting under Combat "Scrolling Text for Self" must be enabled for the floating text to work. If you have any trouble please hit the Reset all dG Killshot Data button. If sounds are too quiet try different Sound Channel settings. Special thanks to the following users for ideas, suggestions, and general help with this mod: zwarmapapa, solidus0079, Blackbeard666, Daisylawlz, Valiard, hatecrew_88 and everyone who has given feedback.